The Silver River on Kickstarter! The Silver River is a new 4X game, designed by Robert Burke and Nate Blivins. Ton Ho Sim has made the artwork. You should really read on because this game looks good indeed. The game supports 1-4 players (1-5 with the expansion), and can, according to the designers, deliver a full 4x experience in just 2 hours. Sounds crazy, right? Well let's just take their word for it and continue, shall we. Normally the genré is sci-fi based games, but there are exceptions, like Clash of Cultures or Dominant Species. 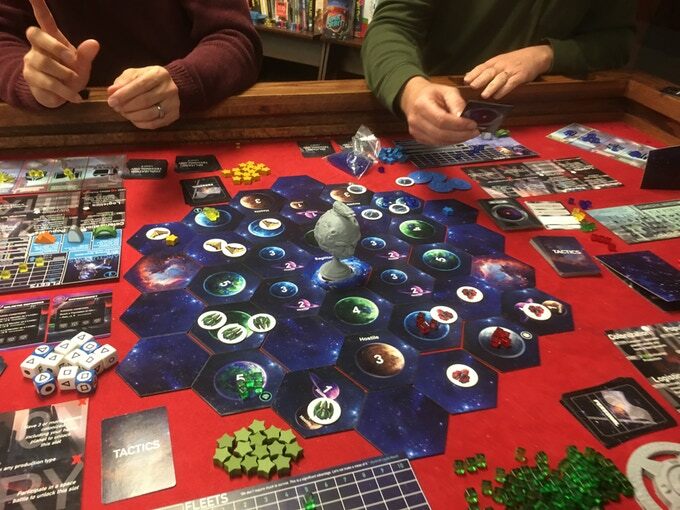 However this game is indeed Sci-fi and is best compared to behemoths like Eclipse, Twilight Imperium (TI4), Space Empires: 4X (SE4X), and Hyperspace. Game in progress. Prototype components. Keep in mind that this is his opinion which obviously can be biased, and also we have done some interpretations of his wording ourselves! More epic feel, as you command fleets instead of single ships. Everything is faster, so no more researching a tech and then move your ship back home to upgrade, then move your ship back to the action. No more build your ships at home and then move them slowly toward the action to maybe use them before the end of the game. Upgrading your fleets and building ships is simple and fast. You can choose to cooperate or compete against another player: You can cohabitate with other players on a planet. You can have your fleet in the same space as another player without battling. You can team up and fight the galactic monsters! You can vote for other players for Political titles. Your trade stations benefit from being near other player's population. Choose your path: At the start of the game, each player has a hand of personal objectives, including political, technological, military, exploration, civilization, and miscellaneous types. Each player chooses five secretly, discarding the rest. Want to play a political and civilization based game, while dabbling in exploration? Choose those objectives and focus on your strategy. Passing: Unique to the genre and gaming as far as I know, we have a Domestic Investment track. When you pass for the Age, you move up on one of 4 tracks here, which gives you an immediate bonus and may be worth VP at the end of the game. This not only incentivizes quick, efficient turns, it adds a layer of strategy and planning about how to accomplish your goals in as few turns and efficiently as possible. This adds a great puzzly aspect to the game. There are a ton more things that I think make the gameplay here really stand out above the competition, but these are a few of the highlights. The Silver River was built to provide a rich 4X experience (Explore, Expand, Exploit & Exterminate), with all its trappings in under 2 hours. 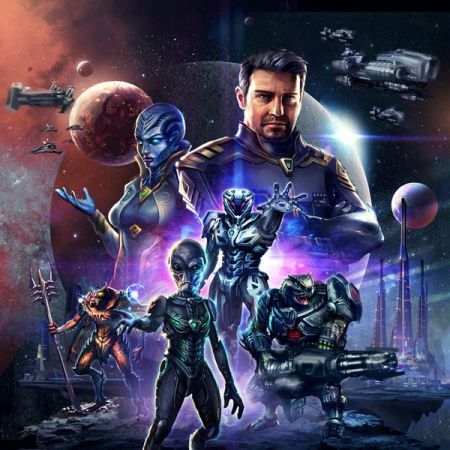 Players will take the role of one alien civilization, and work to earn victory points through exploration, colonization, technology, civilization building, politics, war, and peace. Simulteneous Production and Resource Allocation: Gain raw production equal to your civilization's population each turn, and then allocate it to your areas of choice during simultaneous Governing phases. Use your allocated resources to take actions. True Exploration: Explore planet-less sectors for rewards. Uncover mini-quests to be completed by the end of the round for victory points. Choose War, or Choose Peace: Players may enter any occupied sector without forcing war, players always have the option to attack, or not to attack, and may even agree to co-habitate planets together. Fast Tech Upgrades and Ship Movement: Move fleets of ships, whose size is not visible until they arrive, not individual ships. Upgraded technology applies instantly to all ships/planets/etc. This provides real progression in less time, and with less micromanagement. Ally Against Common Enemies: The center of the map is Sagittarius A*, a place where massive space monsters can be hunted for great rewards, on your own, or with other players. Enough of this! Give me the Kickstarter link already! SHUT UP AND TAKE MY MONEY!!! RAAWWR! Of course, we know better than to stand between a gamer and his/hers latest obsession! Here it is: The Silver River Kickstarter and oh, yeah, it has been funded.